Are the fines listed in the Road Transport and Safety Bill 2014 too severe? The Minister for Road Transport and Highways, Nitin Gadkari delivered a robust speech at the Society of Indian Automotive Manufacturers 54th annual convention held just a few weeks ago in New Delhi. His speech addressed all the concerns any responsible citizen would have with regard to road safety and the gross violation of every traffic rule in the book. His solution to the abject lack of road discipline was simple and resonates with what I've been voicing out for years. Raise the fines to a level that makes every motorist think ten times before violating the regulations! Hooray! While the general focus in the media following that speech revolved around the Rs 5,000 fine to be instated against speeding or breaking a traffic light, there are several more that are even more interesting. You just have to take a look at the draft of the proposed bill which is available on the ministry's website to understand the magnitude of what is about to happen. Now this might read more like a news report and correctly this should have been positioned there but I'd like to build the case for my column and that is why its necessary for me to list out some of these offenses and the relevant fines they will carry. So in the interest of those just too lazy to even copy-paste the link into their browser, here are ten of the more interesting points that caught my attention. 1. Driving without a valid licence is a straight Rs 10,000 fine, and in addition, your vehicle gets impounded. 2. Using a vehicle without registration will cost you Rs 25,000, repeat offenses will attract a fine of Rs 50,000. 3. If a vehicle is delivered without registration, it's a hefty Rs 1 lakh fine. Though whether this will apply to dealers or customer isn't clear yet. 4. Now here are the highly relevant speeding fines. 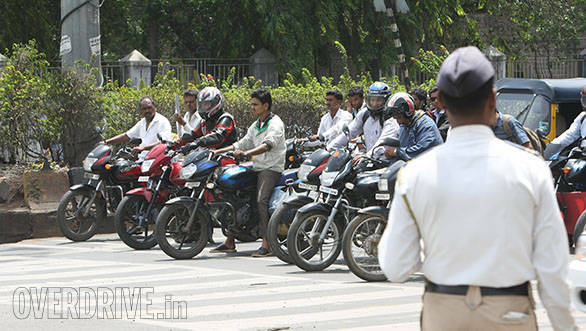 In an LMV (two-wheeler, four-wheeler or any other vehicle prescribed as such), there are various categories of fines. 9kmph above the prescribed limit but below 20kmph will render you poorer by a flat Rs 5,000. 20kmph above the limit but not more than 30kmph increases to Rs 7,500, between 30-40kmph above the limit will set you back by Rs 10,000 and 40kmph above the speed limit will see you dish out Rs 12,500, get an 8 week licence suspension, your vehicle impounded and you will have to go back to do a refresher course. For heavy motor vehicles there is no leeway whatsoever, the fines begin at Rs 10,000 and then follow the same structure as applied to LMVs except the fines are nearly three times higher! In addition if you have a child on board, the fine doubles and each subsequent offense could see your fine doubled and licence suspended for lengthy periods of time. 5. For driving an uninsured vehicle, in case of a two-wheeler, it's a flat Rs 10,000 going up to Rs 25,000 for LMVs and Rs 75,000 for all other categories. Might make sense to pay those annual Rs 2,000 premiums now. 6. Not wearing a seatbelt will attract a Rs 5,000 fine and here's the catch, this might apply to all passengers in a car irrespective of whether you are in the front or rear. In fact the draft proposes to mandate seatbelts for all passengers and to make sure manufacturers henceforth provide seatbelts for every seat in a car. 7. And here is something that should make Shumi smile - riding without a helmet? Get ready to shell out Rs 2,500 and this will apply nationally and I doubt this time around there will be any stupid arguing about the pros and cons of using helmets. 8. Very important, traffic signal violations will attract a Rs 5,000 fine the first time, a second offense is double and a third thrice the basic amount, along with the usual suspension of licence and a compulsory refresher driving course. 9. Driving against the flow of traffic and obstructing an emergency vehicle will get you penalised Rs 5,000, though in my opinion, for the latter it should have been even more exorbitant since it could be a matter of life and death for someone! 10. And lastly but equally important, manufacturing a faulty vehicle could attract a fine of Rs 5 lakh per vehicle or fetch a prison sentence of three months. This last clause is going to get a lot of monkeys running to the courts claiming their cars are defective so this last item will be even more thoroughly and minutely detailed out. This is a landmark draft, if it gets passed India could well and truly be on the way to making our roads safer and healthier. One of the other salient features that I found truly commendable in this draft was that no one under the age of 18 years will be eligible to get a licence. Secondly the draft proposes a central driver licence system that can be accessed online from anywhere in the country. Applications for licences and fees will be accepted online which undoubtedly will make the system simpler and more effective. It even proposes to bring vehicle registration and taxation under a single unified umbrella and intends to implement this within three years. Above all, the ministry intends to involve the private sector in the whole licensing system which will undoubtedly see a few hurdles initially but I believe in no time will operate like clockwork. However I do have a couple of concerns, mainly the implementation and enforcement of all said clauses in the proposed bill. How does the ministry intend to implement these regulations if the proposed bill is indeed passed? Will this mean a complete overhaul of our licensing system? This proposed motor vehicle act is heavily dependent on a more modern system of licensing based on a penalty points system. How soon then, and is the ministry adequately prepared to provide smart licences and a robust infrastructure to support this cause? Will this then mean existing licence holders will have to retake their tests? Since there are millions of driving licence holders in the country already, how does the system propose to update the existing ones. Then there is question of building awareness, how does the ministry intend to ensure all those on the road know their limits. The current density of speed limit signs for instance is laughable, anyone can easily get away claiming not to have seen a signboard with a speed limit posted on it. And rightly so, since most of these sign boards are poorly placed or are in such a severe state of deterioration there is barely anything legible on them. And then there is the question of enforcing these regulations which for nearly two decades has been the weakest link in the existing system. The principal concerns are going to be manpower needed on-ground to actually manage and police traffic. The ratio of traffic regulation enforcers to the number of vehicle users currently is so skewed it is simply impossible to manage traffic in a healthy and responsible manner. Every day I see hundreds of drivers / riders blatantly violating every regulation in the book, most of the time right under the nose of the law. The general sentiment a traffic policeman has is of indifference, simply because there is not much they are empowered with to prevent these crimes. And even if they did make the attempt, it's physically impossible to single-handedly stop the tide of wrongdoers. So how exactly does the ministry intend to enforce these regulations with such limited resources? Where speeding is concerned there is a severe paucity of speed guns in almost every city in India. In my near 15 years as an automotive journalist having driven a few million kilometres all across India, there have only been three locations where I have encountered a speed gun. And even in those places, there was a whole posse of traffic police stationed in just one spot trying to wave down offenders backed by a single speed gun. One of those roads was the Mumbai-Pune Expressway, one a highway outside Ahmedabad and one on the Delhi- Chandigarh highway. In each location there were dozens of cars whizzing by well above the speed limit so it turned into a case of selective policing. Some got caught, most slipped under the radar. Can the ministry ensure that on ground, the traffic police could be provided with all the necessary tools to execute its duties to the fullest? So while I do believe this is certainly the best way to move forward, I do have one suggestion at this point. Even the licensing procedure needs to be made more expensive, if not for first timers then certainly for those who received a licence suspension and need to reapply. If money is the only deterrent, and I fully agree with the proposed fines, then why stop at just that? Why not make the violator doubly unsure of whether he should break traffic laws or not because of the long and expensive chain of events that follow his getting caught? In conclusion, I'd say, shock value is just what this country needs.